The Shingle House by NORD Architecture is the second completed holiday home in Alain de Botton’s Living Architecture project. 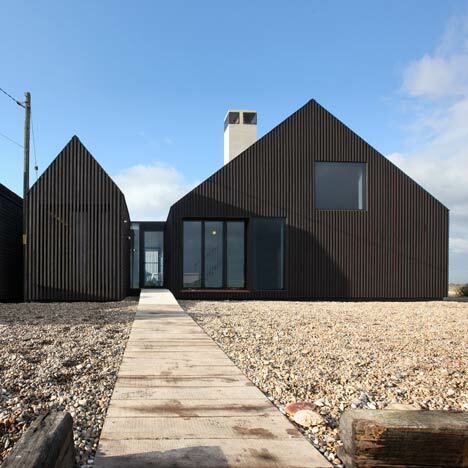 Located on a beach in Dungeness, Kent, the house is clad in tarred black shingles. The interior is clad in white-painted wooden panels. Glazed concertina doors in the living areas and bedrooms open up the interior spaces to the beach. The Shingle House sleeps eight people and is currently available to rent. Living Architecture is a scheme initiated by writer Alain de Botton to create a series of vacation homes in picturesque locations, designed by prominent architects. Peter Zumthor, Hopkins Architects, MVRDV and Jarmund/Vigsnæs Architects have all designed houses as part of this project (see our earlier story). The Shingle House is sited on one of the most unusual and poetic landscapes in England, on the shingle beach of Dungeness, near Romney Marsh. The vast beach is empty save for a random collection of fisherman's huts (many of them owned by artists, including - most famously - the late film-maker Derek Jarman), two lighthouses, the terminus of a miniature coastal steam train and in the far distance, the dramatic form of a nuclear power station. Living Architecture's house is by a young Scottish practice, NORD Architecture, who responded to the natural drama of the site with a simple monumental black house, finished in tarred black shingles on the outside and in a beautiful palette of concrete and timber within. The Shingle House sleeps 8 people, and is available to rent from October 2010.